Para Fungal is a unique blend of plants, barks, and herbs that grow in the Amazon rain forest. These indigenous plants, barks and herbs have been used for years by the native tribes of the Amazon for various physical ailments. 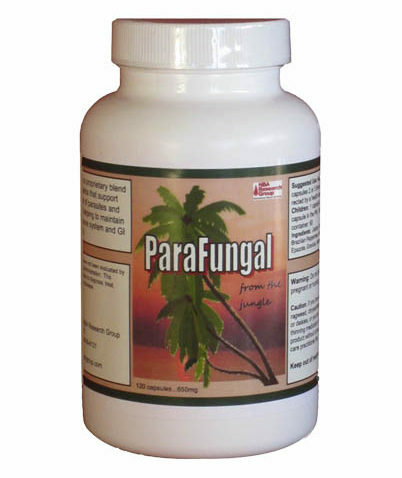 Para Fungal specifically targets fungal and parasitic problems such as, candida & yeast infections, mold, fungal infestions, prostatitis, parasites, and malaria. Para Fungal also acts as an anti-viral & anti-bacterial. Listed below are the herbal ingredients and their reported health benefits. * for candida & yeast infections, fungal infections (athlete’s foot, nail fungus, ect. * for prostatitis, cystitis, and urinary tract infections. * as a natural stimulant & energy tonic. * for candida, yeast and other fungal infectionsfor flu, colds, and upper-respiratory bacterial and viral infections. * fights leukemia and cancer. * fights cancer, leukemia and immune disorders. * for colds, flu and virues, for urinary tract infections. * for candida and yeast infections. * as a heart regulator & mild hypertention to stop bleeding and treat wounds internally & externally. * anti-parasitic, digestive stimulant, liver bile stimulant. * for lice & skin parasites, for intestinal parasites & amebic infestion. * to eliminate toxins & stones. * to treat bacterial & fungal infections. * for liver disorders, for intestinal worms, internal parasites, & skin parasites. * as a protector against cellular damage. * for skin parasies, lice & ringworm. * anti-cancerous, anti-tumorous, anti-microbial, anti-parasitic, hypotensive (helps lower blood pressure). * for internal parasites & worms. * has been used for medical purposes for more than 2000 years. Mohammed claimed that it cured everything but death. * There have been more than 450 peer reviews with nigella sativa in the past 40 years, for a wide range of diseases, such as diabetes, MS, Alzheimer’s disease, hepatitis C and more. Originally, Nigella sativa was used to treat migraines and allergies, but recent discoveries have shown that this little black seed is effective in destroying cancer cells. Previous studies have shown anticancer activity in prostate and colon cancers, as well as antioxidant and anti-inflammatory effects. * Nigella sativa has many benefits. It contains strong anti-parasitic, anti-hypertensive, anti-Inflammatory, anti-tumor, anti-bacterial, and anti-histamine properties. It also strengthens the immune system.